Dry needling and acupuncture are alternative and less-invasive procedures, which stimulate the MTrPs.12,13 It has been reported that dry needling can alter the biochemical environment surrounding an MTrP and reduce spontaneous electrical activity within the MTrP regions of skeletal muscle.14,15 Moreover, this method is safe with minimal side effects when treating chronic pains. Several studies have assessed the effects of MTrP dry needling in the treatment of plantar heel pain.3,12,13 However, their results remain controversial. Therefore, we conducted this meta-analysis to assess the effects of MTrP dry needling in patients with heel pain due to plantar fasciitis. 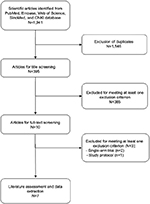 We performed this meta-analysis in adherence with the Preferred Reporting Items for Systematic Reviews and Meta-analysis (PRISMA) statement guidelines.16 Two independent investigators conducted a comprehensive literature review. PubMed, Embase, Web of Science, SinoMed (Chinese BioMedical Literature Service System, People’s Republic of China), and CNKI (National Knowledge Infrastructure, People’s Republic of China) were systematically searched to identify relevant articles up to March 12, 2017. The following structured search strategies were used: (Plantar[All Fields] AND (“heel”[MeSH Terms] OR “heel”[All Fields]) AND (“pain”[MeSH Terms] OR “pain”[All Fields])) AND (myofascial[All Fields] AND (“trigger points”[MeSH Terms] OR (“trigger”[All Fields] AND “points”[All Fields]) OR “trigger points”[All Fields])) AND ((dry[All Fields] AND needling[All Fields]) OR (“acupuncture”[MeSH Terms] OR “acupuncture”[All Fields] OR “acupuncture therapy”[MeSH Terms] OR (“acupuncture”[All Fields] AND “therapy”[All Fields]) OR “acupuncture therapy”[All Fields])). The search was limited to human subjects, and no language restriction was imposed. In addition, we also manually searched the reference lists of the included studies and previous reviews until no potentially eligible studies could be identified. We used a data extraction sheet to extract data from the included studies. The following information was extracted: first author’s name, year of publication, country, number of patients in each group, patient characteristics, methods used for randomization, concealment, blinding, and the main outcomes (changes in the VAS score, success rate for pain, and incidence of adverse events). We also contacted the corresponding author for further information when the data needed clarification or were not presented in their studies. The quality of evidence for outcome measures was evaluated using the Grading of Recommendations Assessment, Development and Evaluation (GRADE) approach.20 The quality of each outcome was classified as very low, low, moderate, or high.20 A summary table was constructed using the GRADEprofiler (GRADEpro, version 3.6; http://www.gradeworkinggroup.org/). The current meta-analysis was performed using Stata 12.0 (Stata Corporation, College Station, TX, USA). For continuous outcomes, they were expressed as weighted mean difference (WMD) with 95% CIs; for dichotomous outcomes, they were expressed as risk ratio (RR) with 95% CI. Before the data were pooled, we used the Cochrane Q chi-square test and I2 statistic to test the heterogeneity across studies, in which P-value <0.1 or I2>50% were considered to be significant.21 A random-effects model (DerSimonian–Laird method)22 was used to pool data when significant heterogeneity was identified; otherwise, a fixed-effects model (Mantel–Haenszel method)23 was used. We also conducted sensitivity analysis and subgroup analysis (based on different durations) to explore the potential sources of heterogeneity whenever significant heterogeneity was present. The presence of publication bias was assessed by the Begg24 and Egger’s tests.25 A two-tailed P–value <0.05 was considered statistically significant, except where a certain P-value had been specified. 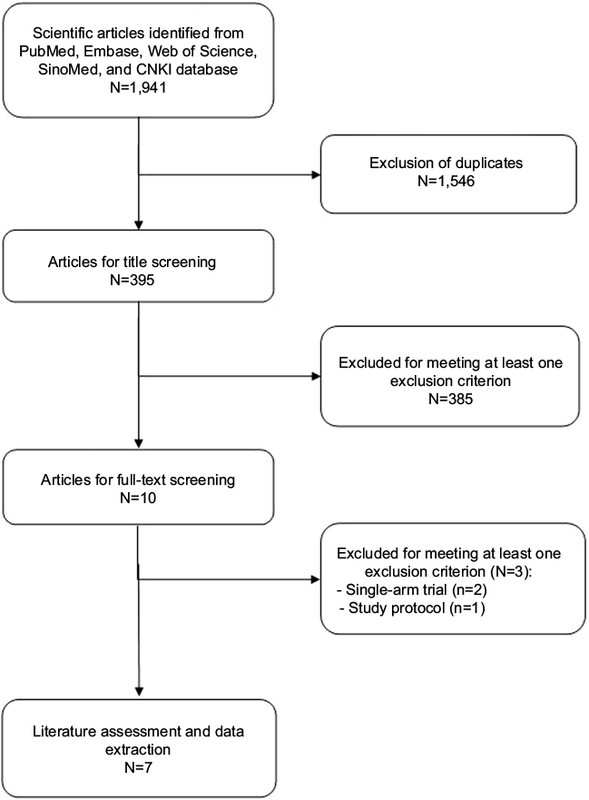 Figure 1 Eligibility of studies for inclusion in meta-analysis. Abbreviation: CNKI, National Knowledge Infrastructure, People’s Republic of China. The main characteristics of the included studies are shown in Table 1. These studies were published between 2011 and 2017. The number of participants ranged from 20 to 108. Of the seven studies, four were conducted in People’s Republic of China,,29,31,33,34 one in Australia,28 one in Iran,30 and one in Thailand.32 Among the seven RCTs, five were published in English language,28–32 and two in Chinese language.33,34 The diagnosis of MTrP varied greatly among the included studies. Some used the palpation of “tender spot in a taut band” and “local twitch response”,29,33,34 while some others added “patient recognition of pain on sustained compression over the tender point” as a confirmatory finding.28,30–32 All RCTs used a VAS to measure the intensity of pain. The success for pain was defined as a minimum decrease of 50% in VAS scores. The details of risk bias are presented in Figure 2. Overall, two RCTs31,32 were regarded as being at low risk of bias, three29,33,34 at unclear risk of bias, and two28,30 at high risk of bias. The main reasons for the two RCTs being at high risk of bias were that the studies were not blinded to the participants or outcome assessors. The main reasons for the three RCTs being at unclear risk of bias were that they did not report the methods used for randomized sequence or allocation sequence concealment adequately. Figure 2 Risk of bias summary. Notes: Red indicates high risk of bias, green indicates low risk of bias, and yellow indicates unclear risk of bias. The GRADE evidence profiles for these outcomes are shown in Table 2. The quality of evidence was moderate for change in VAS scores and success rate for pain, but low for adverse events. Notes: aTwo trials were judged to be at high risk of bias. bModerate heterogeneity (I2 =56.8%) was found. cA total of 417 patients were enrolled. dSubstantial heterogeneity (I2=78.0%) was found. eOne trial was judged to be at high risk of bias. fSubstantial heterogeneity (I2 =85.0%) was found. ‘–’ indicates no data. Abbreviations: GRADE, Grading of Recommendations Assessment, Development and Evaluation; RR, risk ratio; WMD, weighted mean difference; VAS, visual analog scale. All the studies reported the data on changes in VAS scores.28–34 The aggregated results of these studies showed that MTrP needling was associated with a significantly greater reduction in VAS score (WMD =–15.50, 95% CI: –19.48, –11.53; P<0.001) (Figure 3). There was moderate heterogeneity among the included studies (I2=56.8%, P=0.013). Subgroup analysis was conducted based on different durations. 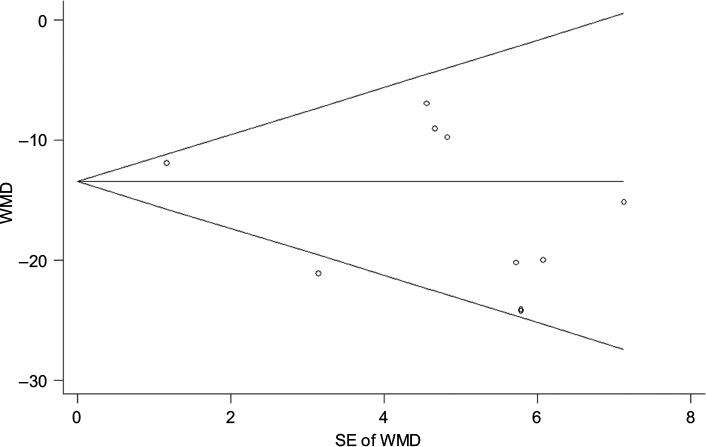 At 1, 6, and 12 months, MTrP needling significantly reduced VAS score (at 1 month: WMD =–15.04, 95% CI: –20.14, –9.94; P<0.001; at 6 months: WMD =–18.20, 95% CI: –26.95, –9.45; P<0.001; at 12 months: WMD =–24.10, 95% CI: –35.45, –12.75; P<0.001). 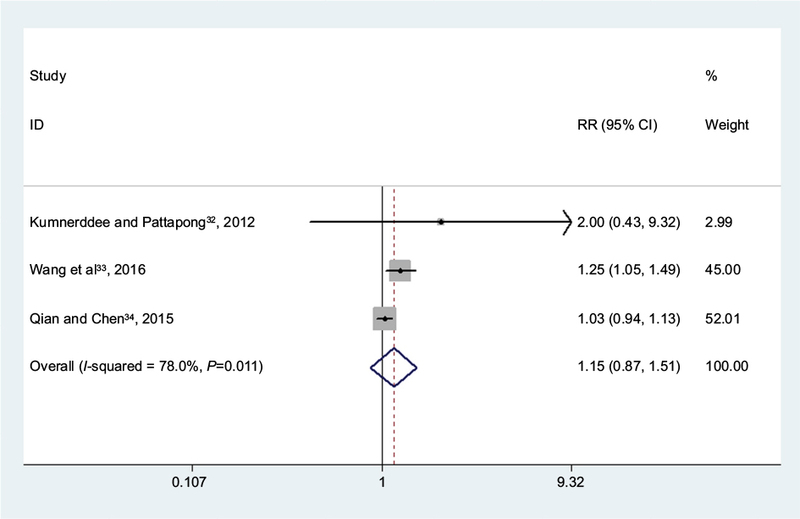 Figure 3 Forest plot showing the effect of MTrP needling on the VAS score. Notes: Weights are from random-effects analysis. The multiple results of the same references are the results of subgroup population in the same reference. Abbreviations: MTrP, myofascial trigger point; VAS, visual analog scale; WMD, weighted mean difference. In the MTrP needling group, VAS scores for morning pain and active pain were significantly decreased compared with control (morning pain: WMD =–42.46, 95% CI: –58.79, –26.12; P<0.001; activity pain: WMD =–38.92, 95% CI: –55.16, –22.67; P<0.001). Three studies reported the success rate for pain.32–34 The aggregated results of these studies suggested that MTrP needling was associated with a success rate for treatment of pain comparable with that of the control (RR =1.15, 95% CI: 0.87, 1.51; P=0.320) (Figure 4). Figure 4 Forest plot showing the effect of MTrP needling on the success rate for treatment of pain. Abbreviations: MTrP, myofascial trigger point; RR, risk ratio. Three studies reported the adverse events.28,29,32 These immediate adverse events were related to needle site pain and were transient in nature. The aggregated results of these studies suggested that the incidence of adverse events was similar between the MTrP needling and control groups (RR =1.89, 95% CI: 0.38, 9.39; P=0.438). 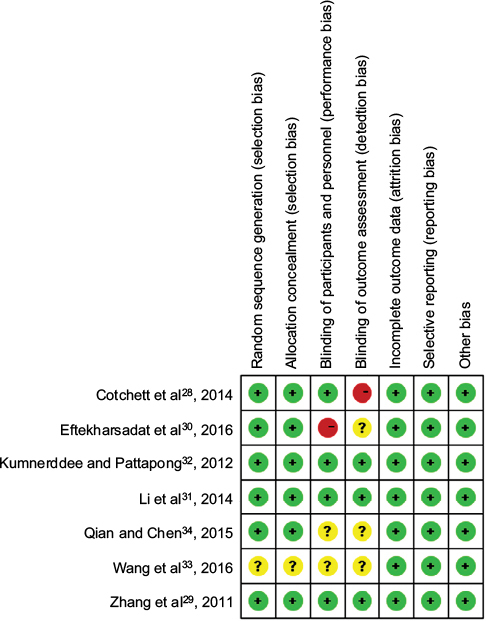 We performed the assessment of publication bias for VAS score using Egger’s and Begg’s tests. The results showed that there was no potential publication bias among the included studies (Egger’s test: P=0.169; Begg’s test: P=0.283) (Figure 5). 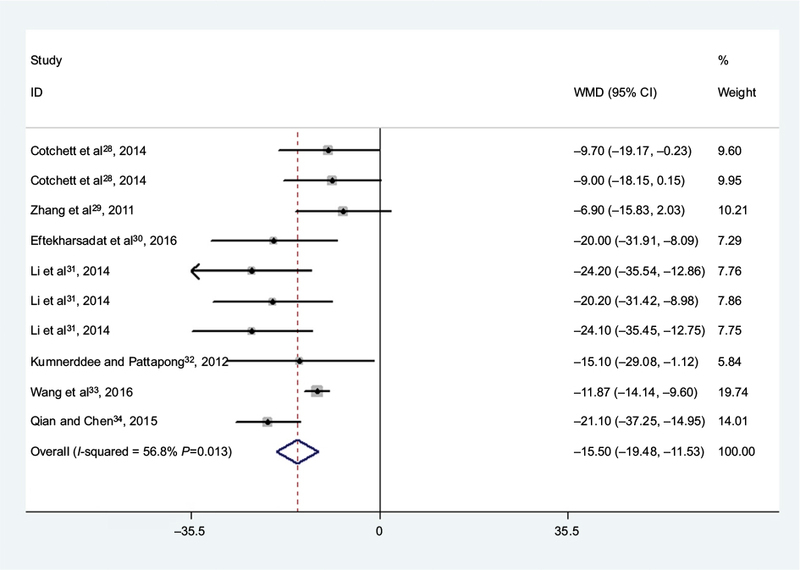 Figure 5 Forest plot showing the test for publication bias for WMD of the changes in VAS score. Note: Figure shows Begg’s funnel plot with pseudo 95% confidence limits. Abbreviations: VAS, visual analog scale; WMD, weighted mean difference. The aim of this meta-analysis was to assess the effects of MTrP needling in the treatment of patients with plantar heel pain. The pooled estimates of all seven included trials using a random-effects model showed that MTrP needling significantly reduced the VAS score and was associated with a similar success rate for pain compared with control. Moreover, the improvements of pain relief were maintained throughout the 12-month follow-up, which indicated that this treatment offered long-term effectiveness. The incidence of adverse events was comparable between MTrP needling and control groups. Although the results of this study suggested that MTrP dry needing significantly reduced the foot pain beneath the heel, the inconvenience brought by it should not be neglected. It was noted from our study that dry needling resulted in minor adverse events (needle site pain or subcutaneous bleeding) and that the incidence of these events was similar to that in the control. In the study conducted by Cotchett et al,28 it was estimated that for every three patients treated with dry needling, one person will experience an immediate adverse event. Patients should be informed about the possibility of these relatively mild and transitory adverse events before the treatment, so that they can weigh the benefits and risks of dry needling. This meta-analysis has several potential limitations that should be taken into account. First, we acknowledge that some of the included RCTs had a relatively small sample size (N<50). Small trials are more likely to result in an overestimated treatment effect compared with larger trials. Second, there was substantial heterogeneity among the included studies. However, this should not be surprising given the large variation in the treatment approaches, needling technique, diagnostic criteria for MTrP, and study design. These factors might increase the heterogeneity and have a potential impact on the treatment effect. Third, two of the included studies were classified as being at high risk of bias, which reduced the reliability of the original results. This meta-analysis indicated that MTrP needling effectively reduced the heel pain due to plantar fasciitis. However, the findings should be interpreted with caution due to the limitations in terms of substantial heterogeneity, poor quality, and small sample size. More large-scale, adequately powered, good-quality placebo-controlled trials are needed to provide more trustworthy evidence in this area. DeMaio M, Paine R, Mangine RE, et al. Plantar fasciitis. Orthopedics. 1993;16:1153–1163. Barrett SJ, O’Malley R. Plantar fasciitis and other causes of heel pain. Am Fam Physician. 1999;59(8):2200–2206. Buchbinder R. Clinical practice. Plantar fasciitis. N Engl J Med. 2004;350:2159–2166. Goff JD, Crawford R. Diagnosis and treatment of plantar fasciitis. Am Fam Physician. 2011;84(6):676–682. Young CC, Rutherford DS, Niedfeldt MW. Treatment of plantar fasciitis. Am Fam Physician. 2001;63:467–474. Simons D, Travell J, Simons L. Myofascial pain and dysfunction: the trigger point manual. Lower Half of the Body. Vol. 2. 2nd ed. Baltimore, MD: Williams & Wilkins; 1999. Simons D, Travell J, Simons L. Travell & Simons’ myofascial pain and dysfunction. The Trigger Point Manual. Upper Half of Body. Baltimore: Lippincott Williams & Wilkins; 1999:1. Crawford F, Thomson C. Interventions for treating plantar heel pain. Cochrane Database Syst Rev. 2003;(3):Cd000416. Landorf KB, Menz HB. Plantar heel pain and fasciitis. BMJ Clin Evid. 2008;2:1111. Acevedo JI, Beskin JL. Complications of plantar fascia rupture associated with corticosteroid injection. Foot Ankle Int. 1998;19(2):91–97. Cotchett MP, Landorf KB, Munteanu SE, Raspovic A. Effectiveness of trigger point dry needling for plantar heel pain: study protocol for a randomised controlled trial. J Foot Ankle Res. 2011;4:5. Itoh K, Katsumi Y, Hirota S, Kitakoji H. Randomised trial of trigger point acupuncture compared with other acupuncture for treatment of chronic neck pain. Complement Ther Med. 2007;15(3):172–179. Itoh K, Hirota S, Katsumi Y, Ochi H, Kitakoji H. Trigger point acupuncture for treatment of knee osteoarthritis – a preliminary RCT for a pragmatic trial. Acupunct Med. 2008;26(1):17–26. Shah JP, Danoff JV, Desai MJ, et al. Biochemicals associated with pain and inflammation are elevated in sites near to and remote from active myofascial trigger points. Arch Phys Med Rehabil. 2008;89(1):16–23. Hong CZ. Lidocaine injection versus dry needling to myofascial trigger point. The importance of the local twitch response. Am J Phys Med Rehabil. 1994;73(4):256–263. Dorsher PT. On the probability of trigger point-acupuncture point correspondences: an evidence-based rebuttal of Stephen Birch’s commentary. J Altern Complement Med. 2008;14:1183–1184. author reply 1184–1185. Higgins J, Green S. Cochrane Handbook for Systematic Reviews of Interventions Version 5.1.0. Oxford: The Cochrane Collaboration; 2011. Higgins JP, Altman DG, Gotzsche PC, et al. The Cochrane Collaboration’s tool for assessing risk of bias in randomised trials. BMJ. 2011;343:d5928. Guyatt GH, Oxman AD, Vist GE, et al. 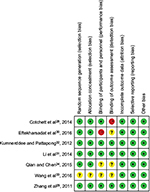 GRADE: an emerging consensus on rating quality of evidence and strength of recommendations. BMJ. 2008;336:924–926. Higgins JP, Thompson SG, Deeks JJ, et al. Measuring inconsistency in meta-analyses. BMJ. 2003;327:557–560. Begg CB, Mazumdar M. Operating characteristics of a rank correlation test for publication bias. Biometrics. 1994;50(4):1088–1101. Egger M, Davey Smith G, Schneider M, Minder C. Bias in meta-analysis detected by a simple, graphical test. BMJ. 1997;315(7109):629–634. Tillu A, Gupta S. Effect of acupuncture treatment on heel pain due to plantar fasciitis. Acupunct Med. 1998;16:66–68. Imamura M, Fischer AA, Imamura ST, et al. Treatment of myofascial pain components in plantar fasciitis speeds up recovery: documentation by algometry. J Musculoskeletal Pain. 1998;6:91–110. Cotchett MP, Munteanu SE, Landorf KB. Effectiveness of trigger point dry needling for plantar heel pain: a randomized controlled trial. Phys Ther. 2014;94(8):1083–1094. Zhang SP, Yip TP, Li QS. Acupuncture treatment for plantar fasciitis: a randomized controlled trial with six months follow-up. Evid Based Complement Alternat Med. 2011;2011:154108. Eftekharsadat B, Babaei-Ghazani A, Zeinolabedinzadeh V. Dry needling in patients with chronic heel pain due to plantar fasciitis: a single-blinded randomized clinical trial. Med J Islam Repub Iran. 2016;30:401. Li S, Shen T, Liang Y, Zhang Y, Bai B. Miniscalpel-needle versus steroid injection for plantar fasciitis: a randomized controlled trial with a 12-month follow-up. Evid Based Complement Alternat Med. 2014;2014:164714. 32.Kumnerddee W, Pattapong N. Efficacy of electro-acupuncture in chronic plantar fasciitis: a randomized controlled trial. Am J Chin Med. 2012;40(6):1167–1176. Wang L, Guo J, Lin F, et al. Efficacy of warm needling plus Chinese Herb Fumigation in chronic plantar fasciitis: a randomized controlled trial. Modern J Integr Trad Chin West Med. 2016;25:416–417. Qian S, Chen L. Efficacy of warm needling plus Chinese Herb Fumigation in patients with chronic heel pain due to plantar fasciitis: a randomized controlled trial. Shanghai J Acu Mox. 2015;34:362–363. Tough EA, White AR, Cummings TM, Richards SH, Campbell JL. Acupuncture and dry needling in the management of myofascial trigger point pain: a systematic review and meta-analysis of randomised controlled trials. Eur J Pain. 2009;13(1):3–10. Tough EA, White AR. Effectiveness of acupuncture/dry needling for myofascial trigger point pain. Phys Ther Rev. 2011;16:147–154. Perez-Millan R, Foster L. Low frequency electroacupuncture in the management of refractory plantar fasciitis. Med Acupunct. 2011;13:1–6. Hsieh YL, Yang SA, Yang CC, et al. Dry needling at myofascial trigger spots of rabbit skeletal muscles modulates the biochemicals associated with pain, inflammation, and hypoxia. Evid Based Complement Alternat Med. 2012;2012:342165. Cagnie B, Barbe T, De Ridder E, Van Oosterwijck J, Cools A, Danneels L. The influence of dry needling of the trapezius muscle on muscle blood flow and oxygenation. J Manipulative Physiol Ther. 2012;35(9):685–691.